Jumping over hurdles to get to the closing table is nothing new for real estate professionals selling luxury properties; it’s practically in the job description. They don’t let obstacles undermine their determination to complete a transaction, whether it’s the federal tax overhaul, which has turned luxury buyers into bargain shoppers looking for reduced prices to make up for higher taxes; or Chicago’s constant bids to increase the real estate transfer tax, which Realtor associations have managed to shut down for now; or buyers’ uncertainty about whether or not the market has bottomed out; or younger buyers’ preference for smaller spaces and the sharing economy. Although market conditions and the political climate are making it tougher to move luxury properties quickly, these sales are still happening. The agents and brokers we spoke with for this article have all recently sold properties priced at at least $1 million in a matter of days. And they do it by knowing what today’s buyers want and presenting it to them in the right way. It’s important to set clients up for success by establishing expectations up front, according to Tommy Choi, president of the Chicago Association of Realtors and co-founder of Weinberg Choi Realty Keller Williams Chicago Lincoln Park. He gives buyers and sellers an “under the hood look at the market,” letting sellers know they need to be patient as luxury properties can take from nine months to a year to sell and explaining how similar properties are faring in the current market. For buyers, Choi said he takes time to explain what the valuation picture looks like in particular neighborhoods now and how property taxes can increase in this climate. In the experience of Joanne Nemerovski, a broker-associate with Compass Chicago, Lincoln Park, the Gold Coast, DePaul and Streeterville are all regions of the city that have always sold better than others. “But now the West and South Loop, Bucktown and Wicker Park are all thriving,” she said. Still, the luxury market is struggling. Choi said the non-luxury market in the city has been outperforming the luxury market for the past couple of years, in terms of closed transactions and median sales. He attributes the situation to the federal tax overhaul, an increase in local property taxes and sluggishness in the new-construction sector. Due to increased costs of land, labor and materials, new construction is priced at a premium and taking longer to sell. This has resulted in shadow inventory — resale homes that should be on the market but aren’t — because sellers are afraid their properties will suffer the same fate. Part of making deals happen in shifting markets is understanding what buyers want. Knowing that an appropriately priced home with updated finishes sells quickly today, Kim Alden, broker and luxury specialist with Baird & Warner in Barrington, begins by asking sellers what’s more important to them: selling their home for the most money or selling it in the quickest amount of time? The goal, of course, is to do both but, sometimes they have to choose, she said. At every sales meeting, Gault and her business partner, Beth Wexler, are reminded by Thad Wong, co-founder of @properties, that the first showing is always online. Only after the buyer has seen and expressed interest in the online listing can the second, physical showing happen. That’s why they only post pictures online that show the home in a positive light. This can require effort on the sellers’ part when there’s a need to make their home look more current, especially in the crucial bathroom and kitchen areas. While it may seem that wealthy sellers would be more willing to spend money on getting a home ready for sale, that’s not necessarily the case. “We want our clients to spend the least amount of money to get the best price,” Wexler said, noting inexpensive updates such as spray-painting cabinets white, painting walls gray and virtual staging can make a difference. The market is shifting and everyone is looking for a deal, according to Alden. “In my past recent sales, all of the purchase prices were well below the construction price or the last sold price. Buyers are trying to make up for the tax ratio by going in lower with price and attempting to get their taxes reassessed at the new purchase price,” she said. Part of making luxury deals pencil out is determining whether or not financing will be necessary or beneficial. Recently, Alden had three luxury sales in Barrington Hills within five weeks, and also sold a luxury property in Highland Park that had been on the market for a long time. But the prices were all lower than the sellers wanted, and two of the three buyers paid in cash. Looking back on all of her luxury transactions, Alden said about 80 percent were cash deals. “Maybe they think it’s a better investment to not be paying interest on it,” she said, noting the interest on a jumbo loan product, 15 to 30 years down the road, could cost more than the home itself. In contrast, on the North Shore and in the city, Gault, Wexler and Nemerovski all said many clients are taking mortgages, even when they don’t need to, for the tax write-off. But as consumers settle in to the new realities of the tax reform bill passed in 2017, that may be less enticing than it has been in the past. In spite of all the obstacles, Nemerovski still believes people will always want to live in their own home and enjoy their creature comforts. “It will still be the American Dream,” she said. Out of sheer nosiness, I’ll occasionally look at listings in our building. One floored me: I had no idea our neighbors were so chic! Then I clicked the next photo and saw reality: a vacant unit with rusty radiators and peeling paint. It was virtually staged — digitally repaired and repainted, with new lighting, furniture and art added to the photos. Welcome to the brave new world of virtual staging: no matter how terrible a place looks in person, it can be magically transformed for the Internet — with the help of a little computer-generated imaging. It’s often hard to tell actual from imaginary space. Architects have always produced renderings, and agents stage with rented furnishings, but now it’s commonplace to do it all on the computer. Scott Harris of Brown Harris Stevens likes it. Unlike some agents, Harris shows the unvarnished floors, too. A one-bedroom at 167 Perry St. as it actually exists, above. The same Perry St. apartment “virtually staged” with furnishings added via computer imaging. A one-bedroom, one-bath in a doorman co-op at 167 Perry St., with river views, a wood-burning fireplace and a small balcony is on the market for $1,399,000. Virtual furnishings lend a hip feeling to this Hudson St. pad. 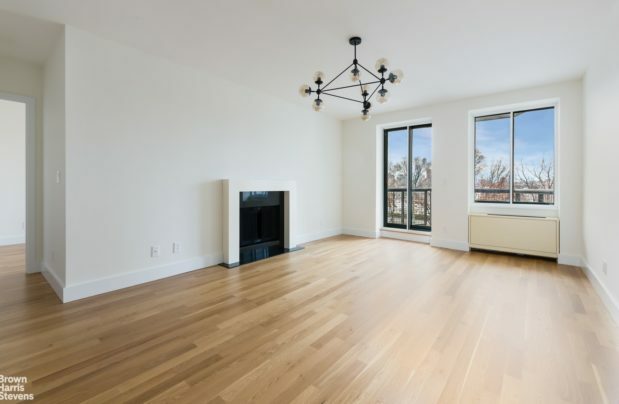 In far west Soho, a one-bedroom, one-bath with high ceilings and huge windows at 255 Hudson St. is for sale for $1,175,000. Festival virtual furnishings enliven this Upper East Side offering. In Carnegie Hill, a two-bedroom, one-bath in a doorman building has a serene bedroom sporting the kind of complicated bed linens you rarely see in real life. $999,999. The real McCoy: The photo of this E. 50s flat features the actual furnishings. 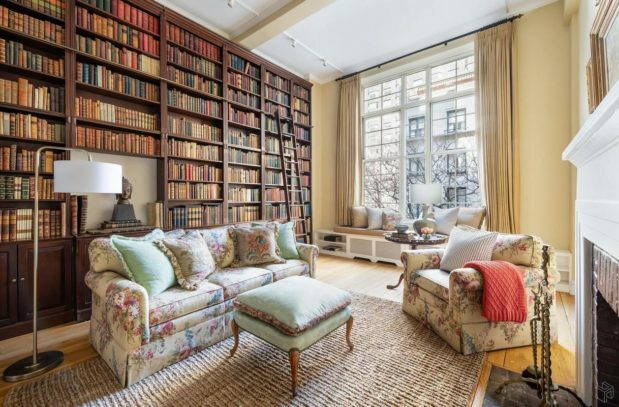 Nothing virtual about 434 E. 52nd St., a two-bedroom, two-bath with yards of built-in bookshelves, 13-foot ceilings, and a wood-burning fireplace, going for $1,695,000. Real-estate marketing continues to evolve exponentially. For decades, agents looking to advertise homes for sale had one option, besides planting signs in front yards: the print media. Then, in the mid-1990s, the advent of the internet shook the status quo. But that only offered a wider, and cheaper, exposure for Realtors’ still photographs. It took almost another two decades for dramatic advances to appear. Now Realtors are expanding their presentations with drone photography, virtual staging, and 3D tours. The best 3D tours are a real step up from the “virtual tours” that appeared a few years ago. Those either seem stilted or tacky in comparison to the 3D tour, and sometimes turn out to be simply slide shows with music. The more naturalistic 3D tour allows you to move around in the room, and among the rooms, and zoom in to inspect details. You either navigate with the computer mouse or arrow keys, or your finger with touch screens. Moving through a property on the smartphone can be more fun than on the computer, although you’re limited by the smaller screen size. For a more immersive experience, you can get a pair of Google Cardboard goggles for $10 and view these house galleries in a realistic dimensionality. All of these options are available for a few home listings at homesantafe.com, the website of Realtor Paul McDonald (Sotheby’s International Realty). “I do think there is an issue with the users’ familiarity with technology and their desire to do something like this, so it would seem to me to appeal to the younger of mind,” he said. “It’s pretty rare that someone has said they want to buy a house as a result of just seeing the 3D tour. Like other technologies that are tiptoeing in these waters, it’s more about the selection process. McDonald has his own Matterport 3D camera. The Matterport has nine lenses: three down, three straight ahead, and three up. The photographer attaches it precisely level on a tripod, then makes a series of exposures in a circle, repeating the process at 30 or 40 locations in the house. When you later view the 3D imaging, there is a circular figure at each location and you can progress from one to the next to move wherever you want in the home. The Matterport facility also offers viewers another perspective, focusing on the plan view, looking down on the room layout from above. Check out the Tesuque Creek property listed on McDonald’s website and you see an example of virtual staging. “This is another technical aspect of marketing a home that’s not real, if you will. They take a CAD drawing, they select things they want to dress it up with [furniture, rugs, paintings on the walls], and then send it ovenight to India, using massive computing power, and when it comes back... you’re not going to believe it’s not really staged when you look at the image. Neil said he agrees with McDonald that the 3D technology appeals more to a younger audience. “I would guess 5 to 10 percent of people use this. “The two things I think are of the most benefit to me as a Realtor is that for people from out of town who have seen the 3D tours, they’ve already walked through the houses and they know which properties they want to see. And most important, if they were here and walked through the actual house and later they can’t recall where the kitchen was. They contact me and I give them the link and they just go online and they can see it all. D'Alessio never took the woman on a tour of the model apartment at the Gianna, at 184 E. 64th St., but the buyer felt as if she had already seen enough of space, since there’s a 3-D model of it on the building’s website. Offering 360-degree three-dimensional tours is taking the presentation of real estate listings to the next level, brokers said. The tours will soon become more commonplace as technology has made creating such virtual tours cheaper than ever, many believe. "For your client [who is selling], you want to be getting the right people through the door," said Alessio, who began incorporating 3-D listings in June. "I think it even weeds some people out. When you have this tool, it's almost their second showing, and you know they're interested as soon as they walk through." GeoCV has been offering its services — including the 3-D tour, high-quality photos and a dollhouse-like floor plan — to brokers like D'Alessio since June. It plans to unveil a do-it-yourself kit at the end of the year for brokers to rent or buy, with a special 3-D camera that attaches to a smartphone using the company’s custom-made rotation device, explained Anton Yakubenko, GeoCV's CEO and co-founder. It takes about an hour per 1,000 square feet to do a photo scan of an apartment and two days to turn around the finished product. The company currently charges 10 cents per square foot for its services, with a minimum of $199 per listing. “It’s really a disruptive price for the market. It costs two or three times more from others,” Yakubenko said about other companies offering 3-D services. His company uses "new generation" smartphones with 3-D cameras, he said, and is moving toward using a regular smartphone with a special attachment. Other companies tend to use pricey special cameras rather than smartphones. His company is also developing an application to create virtual-reality tours of real estate listings, which new developments are increasingly using to give potential tenants a better feel for how the spaces will look when finished. The demand for VR, Yakubenko noted, is less than the 3-D model right now, since few people have VR headsets at home to view listings. But he envisions a future where brokers have headsets in their office or can bring them to clients’ homes. “It’s time-saving for agents and clients,” he said of the tools that can cut down on unnecessary trips to open houses. The 3-D tours even help apartments that may need work and don’t show well in photos, he said. “An agent was selling a townhouse needing significant renovation. He wanted buyers to understand the work involved,” Yakubenko said. While some homes in similar condition often languish on the market, this particular townhouse, in Crown Heights, sold in a couple of weeks, he added. D'Alessio agreed that more transparency can help apartments with potential pitfalls. “It’s better to know what you’re walking into than be surprised,” she said.